Easy Migration – Tool proffers easy migration of Outlook Mac Files to PST without hampering the accuracy of the mails. Batch Conversion- Software supports batch conversion of Multiple OLM Files & preserve the folder hierarchy. Split PST- Option to break the large PST file into smaller one for easy management. Advanced Naming Convention- This option to save the individual email with - Subject, Date, Document Type & many more options wisely. Export Selective Folder- Users can export selective/multiple folder from OLM in Windows PST format in one go. Supportive on all Windows Editions- Supports all editions of MS Outlook (2016 & below) & all Windows versions including 10. Facilitates the user by converting Outlook 2011 OLM to Windows Outlook format in a convenient manner. User can export Address Book, Calendars, Journals & entire items to PST file format with accuracy. The strong algorithm of the software converts all emails along with corresponding mail attachments and attributes. Moreover, exports the attachments like images, PDF & some other documents in improper format can be exported as it is. Tool helps to save multiple OLM files into EML or MSG format. As the both file extensions are easily accessible in various email clients as in Outlook Express, Windows Mail, etc. Software provides multiple advanced features as it creates the preview of the entire OLM data items such as mails, contacts, calendars with attachments. In addition, the software keeps all email properties intact . Tool provides the facility to export selected items from the Outlook 2011 database to the PST, MSG or EML format. For this, users have to select the item which they want to transfer and so on. Users can extract the data from multiple OLM files at the same time, just need to Click the add button & the multiple OLM files will be added automatically & converted easily with less efforts. Tool neither affect nor damage the folder structure of the OLM File. Even after the conversion from OLM to Windows Outlook file format, it retains the integrity of the email data & keeps the structure, formatting, Meta data same as it was before conversion. Provides an efficient file Naming option with OLM to EML/MSG conversion through which user can save their Outlook 2011 messages by its Subject, date, document type etc. Software has an option to save the scanned result of the OLM data item. As the scanning procedure of converting OLM to PST gets completed. It will help the user when they re-use the software in future, then they do not have to re-scan the file again. Tool supports all the editions of Windows including 10. This feature facilitates the user to view the OLM files out of the Mac environment within all its attributes. Outlook for Mac users have the inclination for buying Outlook Mac Exporter software because they know that this professional application has mesmerizing working tactics that led to migrate data from Mac to Office 2013 and other editions. For those who think that it is a new OLM to PST converter have wrong interpretation because this application is created by renowned software professionals since a long time ago, who keep themselves busy in upgrading this app time to time to give a new look to Convert OLM to PST. OLM file is associated with Outlook for Mac 2011 mail client, a personal information manager which is one of the important parts of Microsoft Office for Mac created by Microsoft Corporation. An OLM file comprises of email messages and other important data files. In a single OLM file, there is inclusion of Outlook folders, contacts, calendars, task list, note list managers, Inbox etc. It is a database file like many other database files such as .acc, .rsd, etc. Suppose you are trying to transfer OLM 2 Outlook PST and you are unable to perform this data transfer easily. Besides you have many mails to transfer to MS Outlook installed on your Windows based laptop. The requirement for Mac to Office 2013 is not only your necessity but of-course of many. Since, the mission to make this migration successful, you need to show high dependency on external software solutions to Convert OLM to PST. Outlook Mac Exporter application here does not only holds a special place in this conduct though also facilitates UNLIMITED aspects for novice performers. This application is a Trouble-FREE solution to make Mac email to Outlook Express migration. Using this app, you can migrate data from Outlook 2011 into MSG, if the need is to convert single mail message in Outlook. Convert OLM to PST Tool does also supports in converting OLM files in EML files, in a way it is an open platform for converting Mac email to Outlook Express. Tool considers its responsibility to migrate highly sensitive data with proper care into Outlook for Windows platform without affecting issues like data loss. In the free of cost demonstration edition, one can collect info through how OLM to PST converter exactly performs data migration and what kind of features being used in it. You will see conversion process of first 25 items from OLM to PST, EML and MSG. I am highly impressed with the quick and smart response from the support team. They were very helpful with the transaction process and explained us our queries very firmly. 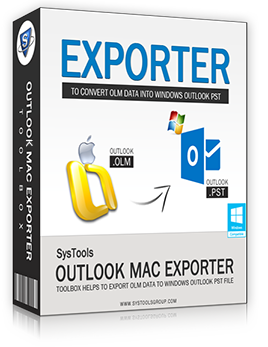 Outlook Mac Exporter is a genius technology to rely upon for exporting OLM files to Windows Outlook conversion. A few days back, I decided to migrate to Windows Outlook from Mac Outlook owing to the additional features exhibited by Windows Outlook. Outlook Mac Exporter made this tedious task a very simple and easy one. It migrated the entire Mac Outlook data in PST format. Simply a worth praising tool! I wanted to export all OLM files to PST & ultimately I did that with the help of Outlook Mac Exporter Tool. What I like about this tool is its user friendly interface that helps me a lot to perform the complete operation successfully. Due to different OS in my new Office, I was not feasible to continue work on Windows email client. But the Outlook Mac Exporter solves all my headache & exported all my old mails to the Windows platform. Thanks to the development team for making such a wonderful product. Copyright © 2007-2019 www.convertolmtopst.com | All Rights Reserved.